The Pens Hockey Show: SID UPDATE!!! Sid has been working this summer and doing his normal summer workouts. Sid has finally been cleared for practice and has been working with the team at training camp. He said, he has felt good and that he has really pushed himself. He reported that he has not felt any symptoms after these pratices. 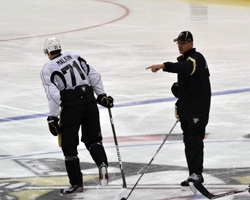 At yesterday's training camp practice, Sid got a standing ovation from the crowd and it was really cool. I am so glad to hear that he is doing well and I think everyone in Pittsburgh is happy to see him back on the ice. I think he will make a full recovery and hopefully be ready for the start of the regular season. On a side note, the Pens training camp has been going great. A new line combination of Geno, TK, and Sullivan has been working great together. It is nice to see Geno back in action and doing well. It looks like this year's team is really looking good and I can't wait for the season to start, it has been a long summer. I am finally ready for hockey season to start. First preseason game is Wednesday against the Red Wings @7pm.